KUALA LUMPUR: Prices of condominiums in the luxury Kuala Lumpur City Centre (KLCC) enclave could fall as much as 30% as waning demand erodes sellers' bargaining power to dictate prices, according to real estate consultancy Rahim & Co Chartered Surveyors Sdn Bhd. This comes against the backdrop of a real estate sector downcycle in the country amid a global economic slowdown which has curbed demand for local real estate among local and foreign buyers. "I think the worst scenario would be a 25% to 30% decline for KLCC condominiums. Fortunately, at least for now, property prices in Malaysia have not dropped at the pace seen in London, Hong Kong and Singapore," Rahim & Co executive chairman Datuk Abdul Rahim Rahman told reporters at a real estate seminar organised by the firm here on March 3. The KLCC enclave where the iconic Petronas Twin Towers sits has been a popular real estate spot for foreign buyers in recent years when asking prices had reached RM2,000 per sq ft.
Across the globe, real estate prices at places like London, Hong Kong and Singapore had fallen some 45% across the board, according to the real estate expert who founded Rahim & Co in 1976. Existing macro dynamics are expected to weigh on Malaysian property prices. This is against a backdrop of rising unemployment and tighter financing policies which could erode consumers' purchasing power. Waning demand aside, massive supply of properties from aggressive launches in previous years is also expected to contribute to the ongoing downcycle in the local sector. Based on OSK Research Sdn Bhd's estimates, more than 5,000 units of luxury condominiums are expected to hit the Klang Valley market this year.The number is, however, expected to ease to about 2,000 units the following year. Existing supply and demand forces in the home property sector are expected to translate into lower rental yields, hence limited capital appreciation and falling real estate prices. Such a backdrop could prompt investors and speculators to exit the market, and keep end-users on the sidelines, therefore, further curbing demand for real estate, and fuelling the decline in property prices, according to OSK. PROPERTY firm UDA Holdings Bhd is investing RM111 million to build a Street Mall and a four-star hotel in Malacca. It has bought a 1.48ha land on Jalan Tun Ali for RM11 million from the Malacca state government and will spend another RM40 million to develop the hotel, which will be managed by its hotel management arm Ancasa Hotel & Spa. There are currently three local hotels under the Ancasa banner. The remaining RM60 million is the gross development value for the Street Mall, which will have about 100 shoplots. "We expect the hotel's return on investment to come in between six-and-a-half years and seven years," said UDA managing director Datuk Jaafar Abu Hassan at a signing ceremony in Kuala Lumpur yesterday. Also present were Malacca Chief Minister Datuk Mohd Ali Rustam and Entrepreneurs and Cooperative Development Minister Datuk Noh Omar. The company has engaged retail consultant, Henry Butcher to oversee the development of the mall. Construction of the project is expected to start in September and is targeted for completion by 2011. Jaafar said UDA is also in discussion to develop phase two of the Street Mall. It was earlier reported that the group plans to double its landbank in the country to about 800ha to develop hotels and shopping complexes. It is eyeing land in Kuala Terengganu, Johor Baru and Kuantan for hotel development and Malacca and Kuantan for commercial complexes. Noh Omar said the development of the street mall by UDA, an agency under his ministry, will encourage more Bumiputera to be business owners. "The Street Mall is located in the city centre and is near the UiTM Malacca campus. It is a vibrant area with high traffic, definitely a good business area," he said. UDA, which owns and operates malls, rents out space to small Bumiputera businesses at subsidised rates and leases are renewed every two years. KUALA LUMPUR: The Second Penang Bridge project will remain at RM4.3 billion despite the fall in oil prices and it is on track to be completed by mid-2012, the Dewan Rakyat was told. The Deputy Minister in the Prime Minister's Department Datuk S.K. Devamany said on March 3 the contractual cost was fixed at RM4.3 billion while there could be variation in prices for several items. The contract for the superstructure was awarded to UEM Builders Bhd subject to a final agreement with Jambatan Kedua Sdn Bhd (JKSB). He added the land highway package would be implemented via an open tender, adding JKSB was preparing the tender documents. "As of now, there is some delay in the implementation of the project as the contractor involved has not been able to enter the construction site at Batu Kawan," Devamany told the House when answering a question from Lim Guan Eng (DAP - Bagan). Lim had asked the Prime Minister to state the status of the tenders for the superstructure and the land highway packages in the Second Penang Bridge and whether the cost of the project would be reduced due to the drop in oil prices. Devamany said the Federal Government would finalise the negotiations with the Penang state government and the would-be affected clam breeders on the compensation. He expected the contractors to start work early this month once JKSB had compensated the clam breeders for vacating the site. "Nevertheless, the delay to the work schedule is not worrying as it is not expected to affect the completion date of the Second Penang Bridge by middle of 2012," the deputy minister noted. According to Devamany (BN - Cameron Highlands), the RM4.3 billion construction cost did not include the RM110 million to reclaim the land, RM100 million to compensate the fish and clam breeders, and development cost of some RM285 million. He added a special purpose vehicle set up by UEM Group Bhd would finance the project via loans from China ExIm Bank and Bank Pembangunan Malaysia Bhd as well as equity contribution by the UEM Group. 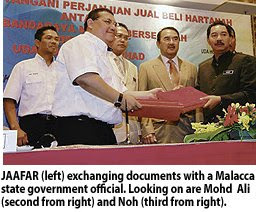 "The loan of US$800 million (RM2.8 billion) from China ExIm was based on a low and irresistible interest rate of 3%. This is far lower that than what was offered by the local capital markets and other financial institutions" he added. Devamany said the loan from Bank Pembangunan Malaysia was RM1.4 billion while equity contribution by the UEM Group amounted to RM50 million, adding the government would bear the remaining RM260 million in financing.